Shares of tyre maker MRF Ltd failed to react even after the company announced record revenue of ₹ 10,000 crore for the year ended 30 September, a 30% increase from a year earlier. 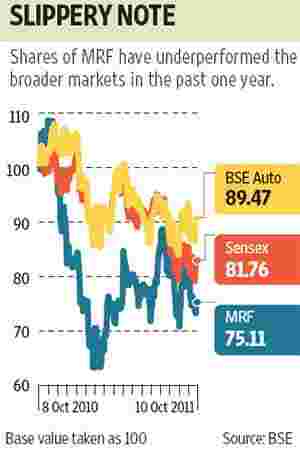 Two reasons continue to worry investors: one, galloping rubber prices, which have just begun to ease; and two, the slowing of original equipment and replacement demand across all automotive categories, barring two-wheelers. The management stated that operating profit for the 12 months will be lower than the year-ago period. While rubber prices have come off from all-time highs, MRF, like its peers, is saddled with high-cost inventory. Finished goods inventory (tyres) remained high during the September quarter, as demand slowed. With nearly half its revenue coming from the commercial vehicle segment, volumes could take a beating in the ensuing quarters. MRF’s presence in two-wheelers, which continue to post double-digit growth, should reduce the decline in overall sales volume. Also, the benefit of lower rubber prices during the September quarter may be negated by the depreciating rupee that makes imports costlier. Analysts estimate a 250-300 basis points dip in operating profit margins for the September quarter and an equally steep drop in the full-year margins, when compared with the corresponding year-ago periods. One basis point is one-hundredth of a percentage point. Besides, the management views that given the current production levels and product mix, rubber prices above ₹ 200 per kg will hurt profitability. And, rubber prices have hardly fallen below this threshold over the last one year. A dull outlook for the auto sector that seems to threaten volume expansion has been further aggravated by the removal of anti-dumping duty on cheap tyre imports from other Asian countries such as China and Korea. This will also make it difficult for tyre firms to increase prices and protect their profit margins. These factors paint a rather gloomy picture ahead, which along with low liquidity in the MRF counter, has kept away investors. It isn’t surprising that the shares, trading at ₹ 6,600 apiece, have underperformed both the BSE Sensex and the auto index over the last one year.